Entering from the Suspension Bridge of XTBG, you can see a large bamboo collection (7 ha). The collection contains more than 200 bamboo species from Southern Yunnan, Guangdong, Guangxi and Hainan Provinces and tropical regions of Southeast Asia.It is said to be one of the largest display bamboo gardens in China, functioning for scientific research, science popularization, and eco-tourism. When strolling along the bamboo path, you will not only meet some precious species such as Buddha Bamboo (Bambusa vulgaris), Greenstripe Bamboo (Bambusa vulgaris), Dragon Bamboo (Dendrocalamus sinicus), but you will also find species that are used daily by the local Dai people, such as the Rice Aroma Bamboo (CephalostachyumPergracile) which they use for cooking rice, or the Sweet Bamboo (Dendrocalamus hamiltonii) with its delicious shoots. In Xishuangbanna, the two-storied bamboo stilt houses are common in the traditional Dai villages. The Dai ethnic group connects bamboos with their traditional rituals as in celebrating the water splashing festival. 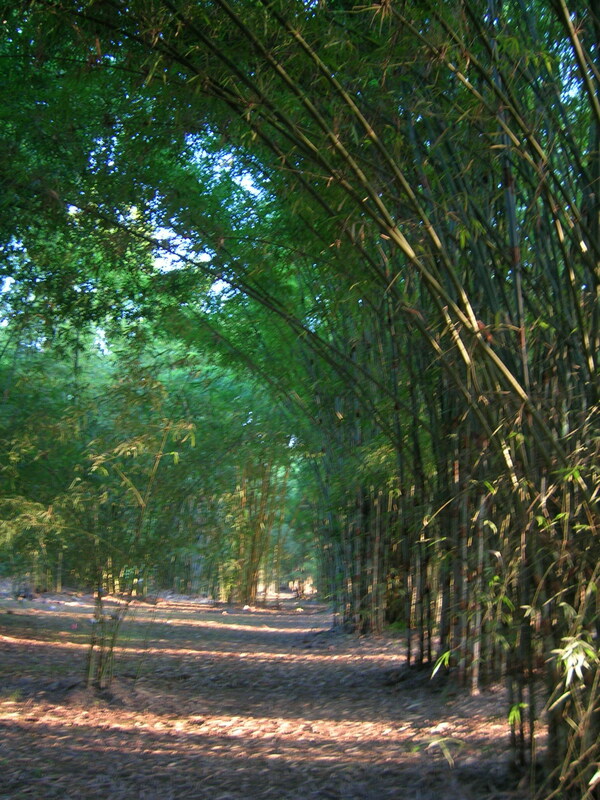 In particular, the Bambusa multiplex var.nana (fernleaf hedge bamboo) is closely related with the local Dai culture. 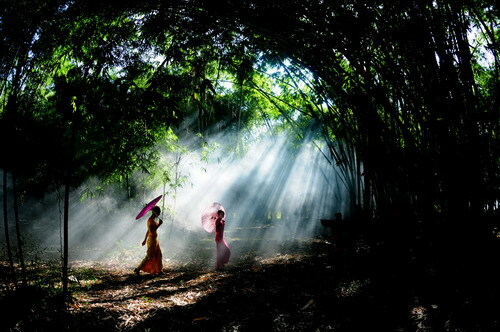 The ethnic song “Fernleaf Hedge Bamboo in the Moonlight”, an example of tropical romance, is very popular. *Local Dai ethnic young men and girls like to date in the fernleaf hedge bamboo woods in the moonlight, singing love songs.